The Delicious at Jalan Tun Razak. This is the newest branch out of the other 3 around Klang Valley. One at Bangsar Village II, 1U and at The Marc Residence. I chose JTR branch simply because it's new and nearer to The Marc branch, also its convenience to get car park, just a RM3 per entry and you have the option to park right in front of the elevator, or RM8 for the valet service. The setup is very nice and the atmosphere was quite relaxing and peaceful, suitable for small group chit chat or a romantic dinner for two. Homemade Pesto Spaghettini, not bad but not outstanding. The Roasted Duck Red Curry set. Like the pasta, the curry tasted ok but not outstanding. However, the duck was really bad, certainly it's from the fridge. Imagine you were eating a 3-day old KFC chicken! Yes, it's that bad! It stunk! I did not complain though, I was rushing back to office for a night conference, couldn't afford to wait for a replacement. But, I would suggest to think twice if to order food under DeliEast section (in the menu), like my Rotten Duck Red Curry, opps, Roasted Duck Red Curry. Anyhow, there must be a reason for its establishment of 4 branches, so I will give a second try on other stuff in the menu before I conclude the food quality of this restaurant, this time I might just be an unfortunate one. GPS coordinates: N3 09.291 E101 43.302. 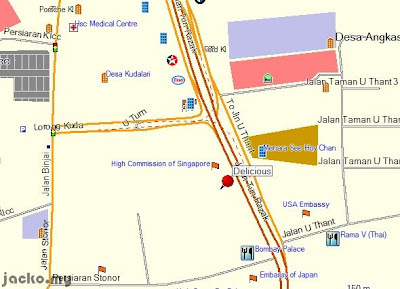 Search for Dua Residency, Delicious is located at the same building. may i now delicious is halal or not? Yes, quite a number of Muslims were there when I visited again yesterday. i have tried the branch at The Marc Residence and the duck that is superb, maybe is that branch problem, and u should try the dessert chocolate brownies...very nice, try give them a second chance at other branch maybe. Thx Chai for recommendation! Ya, may be I shall try the other branch.